Shreveport’s own, J. Marshall Haynie, MD, joined Orthopedic Specialists of Louisiana in August of 2016. 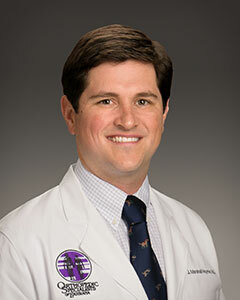 In that short time, Dr. Haynie has established himself as a highly approachable and skilled surgeon. First and foremost, Dr. Haynie wants to create a dialogue with his patients and discuss the most viable options to help restore foot and ankle function so that they can resume a healthy and active lifestyle. He sees all ages and all different conditions from deformity corrections, arthritis to sports injury. He exhausts non-operative treatments initially to have as little impact on his patients lifestyle, but when surgery is the best choice, he and his team play an active role assisting patient before, during and after surgery. When time allows, Dr. Haynie enjoys spending time with family and friends, as well as, hunting and fishing. Dr. Haynie and his wife, Dr. Amanda Haynie, (Pediatrician, Mid City Pediatrics) have truly enjoyed being in Shreveport. As well as, growing their medical practices, the Drs. Haynie were also blessed to welcome their son, Jack, this Spring. Dr. Haynie sees patients in both the Shreveport and Bossier locations of Orthopedic Specialists of Louisiana and performs surgeries at Specialists Hospital Shreveport. I broke my foot (Jones Fracture) in December 2016 and it took six months for doctors in my area to realize it wouldn’t heal on its own. I went to see Dr. J Marshall Haynie and after x-rays and exams, he repaired the break. I received great, friendly care with Pre-op, surgical staff and post op folks. His nurse and stall are so friendly and put you at ease. Dr. Haynie’s personality doesn’t give you that “White Coat Syndrome” feeling. If I or my family ever need any help, I will gladly go to this place filled with what seems to be the best collection of Drs. and staff available under one roof. Thanks again, Dr. Haynie. They get you in quickly and they call you back quickly. The doctor examines and listens to your symptoms and tells you what is needed to fix the problem. Thanks to Dr. Marshall Haynie and his wonderful staff.